Curriculum for singing time for 2019 is now available! There are now 3 suggested songs for each month! How wonderful! If you want to teach all 3, you can. If you want to focus on 1, you can! Options are so wonderful! You decide what works best for you and your primary and go from there. Here are a few of my personal thoughts in order to try and fit it all in while keeping my sanity! After discussing it with the primary presidency, I've chosen one of the suggested songs for the months January - September that will be presented at the program (the program is suggested to be in the last quarter of the year - my preference being the end of October). I made my choice based on what our primary knows LEAST, (or that I've never taught before) in order to bring in more variety to singing time (my choices are below). I've also incorporated 1 hymn (1st verse only). For the other 2 suggested songs, I will be treating them like an opening song that we'll rotate singing every other week during that month. I would prefer that they are sung at the beginning of opening exercises, before the prayer if possible. But if not, I'll sing them at the very beginning when I start singing time. With this arrangement, I'll still be able to keep up my current rotation of 2 weeks working on program songs, 1 week singing something seasonal or holiday (which a lot of times we need to prepare something to sing in sacrament meeting like on Mother's Day, Father's Day, Easter, etc.) and 1 week to review the songs we've learned for the year. All while singing everything that has been suggested. It's a win, win! You can find more information on my monthly scheduling HERE. For our primary's Christmas gift this December, I also create a CD with ALL of the suggested songs. See how I do that HERE. This way I'll be able to get all the songs to the kids, helping them to sing them at home. October is typically program review so the suggested songs will most likely be treated as opening songs each week. Then November and December I'll again sing the suggested songs as opening songs and teach seasonal the rest of the time. To help you stay organized throughout the year, I've got a 2019 Planner and Scheduler HERE. 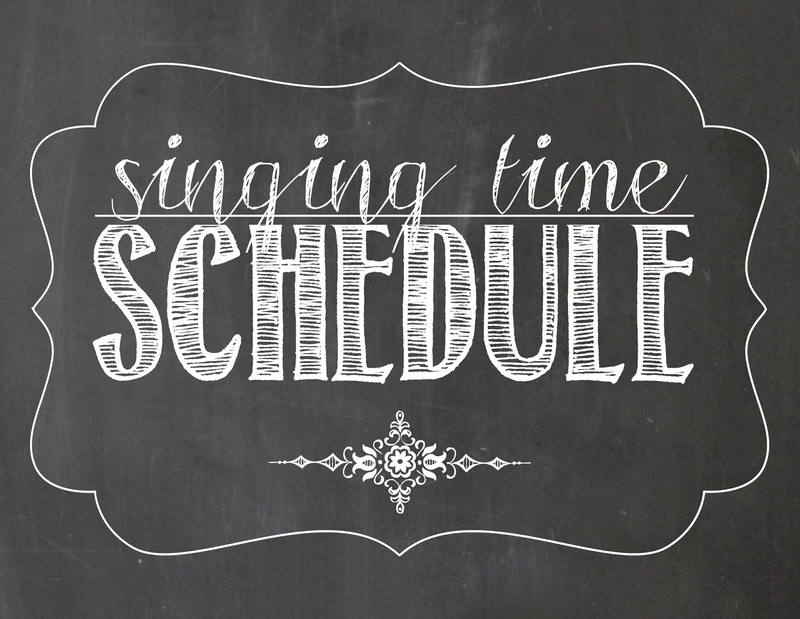 You can also check out my most recent monthly singing time schedule posts HERE that have detailed lesson plans for each week during the month. Below, I've gone through some of the information and found relatable lesson plans throughout my blog, hoping it's helpful. I've bolded and marked the songs with an (*) that I'm tentatively planning to teach for the 2019 program. “Did Jesus Really Live Again?” Children’s Songbook, 64* more to come this year! “I’ll Walk with You,” Children’s Songbook, 140–41* more to come this year! “I Know That My Redeemer Lives,” Hymns, no. 136* more to come this year! I LOVE that I don't have very many repeat songs that I've taught before! I'm on a mission to sing most of the Children's Songbook before it gets changed!! And this will help SO SO much!! 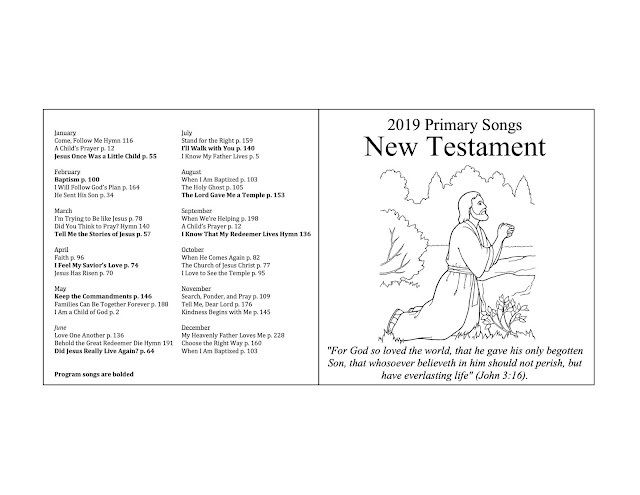 If you want a complete list of all the songs found in the Come Follow Me primary curriculum, I've got a link posted HERE (a document posted by Allison on that post). But I did notice that each of the suggested songs for singing time correlate to Come Follow Me. Okay, on to more suggestions found in the Instructions for Singing Time...there are activities suggested to help you teach doctrine as well as the music. I've gone through my blog and found a few activities where I've demonstrated those suggestions (or similar ones). For a complete list of my entire blog, check out my Song Index tab HERE and Review Activities tab HERE. Read related scriptures: For many of the songs in the Children’s Songbook and the hymnbook, references to related scriptures are listed. Help the children read some of these passages, and talk about how the scriptures are related to the song. You could also list a few scripture references on the board and invite the children to match each reference to a song or a verse from a song. Fill in the blank: Write a verse of the song on the board with several key words missing. Then ask the children to sing the song, listening for the words that fill in the blanks. As they fill in each blank, discuss what gospel principles you learn from the missing words. Quotations from Church leaders: Invite the children to listen to a quotation from a Church leader that teaches the same gospel principle as the Primary song. Ask them to raise their hand when they hear something that helps them understand the truth they are singing about. Ask them to share what they heard. Testify: Bear brief testimony to the children of gospel truths found in the Primary song. Help the children understand that singing is one way they can bear testimony and feel the Spirit. Stand as a witness: Invite children to take turns standing and sharing what they learn from the song they are singing or how they feel about the truths taught in the song. 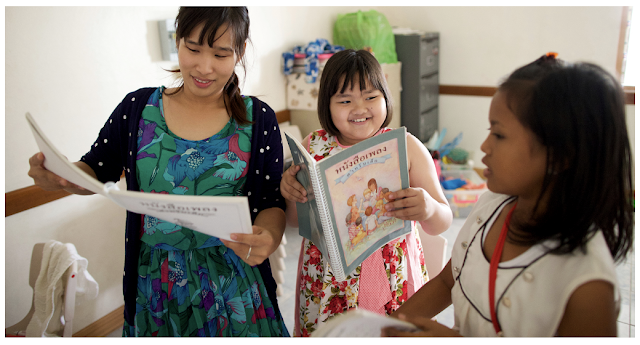 Ask them how they feel as they sing the song, and help them identify the influence of the Holy Ghost. Use pictures: Ask the children to help you find or create pictures that go with important words or phrases in the song. Invite them to share how the pictures relate to the song and what the song teaches. For example, if you are teaching the song “I Will Follow God’s Plan” (Children’s Songbook, 164–65), you could put pictures throughout the room depicting important words from the song (such as gift, heaven, home, earth, and birth). Ask the children to gather the pictures and hold them up in the correct order as you sing the song together. Share an object lesson: You could use an object to inspire discussion about a song. For example, the song “Faith” (Children’s Songbook, 96–97) mentions a little seed. You could show the children a seed and talk about how we show faith when we plant a seed; this could lead to a discussion about ways we show faith in Jesus Christ, as described in the song. Invite sharing of personal experiences: Help the children connect the principles taught in the song with experiences they have had with those principles. For example, before singing “I Love to See the Temple” (Children’s Songbook, 95), you could ask the children to raise their hands if they have seen a temple. Invite them to think as they sing about how they feel when they see a temple. Ask questions: Ask the children to listen for answers to questions in song lyrics. This can lead to a discussion about the truths taught in the song. There are many questions you can ask as you sing songs. For example, you can ask the children what they learn from each verse in the song. You can also ask them to think of questions that the song answers. Listen for answers: Ask the children to listen for answers to questions such as “who?” “what?” “where?” “when?” or “why?” For example, in the song “Baptism” (Children’s Songbook, 100–101), they could listen for who baptized Jesus and where, when, how, and why He was baptized. You could also ask the children to listen for key words or to count on their fingers how many times they sing a certain word. Create posters: Display posters with the words from each verse or pictures that represent the words. As the children sing, cover up some of the words or pictures until they can sing the entire verse without the poster. You can also invite the children to help you create the posters. Demonstrate the pitch: To help children learn the melody of a song, hold your hand in a horizontal position, and as you sing the words, move your hand up to indicate higher pitches and down to indicate lower pitches. Echo: Invite the children to be your echo by repeating what you sing. Sing to the children a short phrase or a line, and then have them sing it back to you. Use variation: Sing songs in a variety of ways, such as whispering, humming, clapping the beat, varying the tempo, or singing while sitting or standing. You could also make a cube out of paper and, on each side of the cube, write a different way to sing. Invite a child to roll the cube to decide how the children will sing the song. Sing in groups: Give each class or individual one phrase to sing while standing, and then have them exchange phrases until each class or individual has had a turn singing each phrase. Girls sing, boys sing: Draw a picture of a boy and a picture of a girl, and glue or tape the pictures onto separate sticks. While reviewing a song, hold up one of the pictures to indicate who should sing that part of the song. Basket toss: Place numbered baskets or other containers at the front of the room—as many containers as there are verses of a particular song. Invite one of the children to toss a beanbag or crumpled piece of paper into or near a numbered container. Have the children sing the verse with the same number as the container. Match a picture to a phrase: Write each line of a song on a different piece of paper, and find a picture that represents each line. Place the pictures on one side of the room and the papers on the other side. Sing the song, and ask the children to match the pictures to the words. This will be an exciting year with all the changes! I'll be posting lesson plans for as many of the suggested songs as I can so stay tuned!! I've recently joined with an advertising company. What readers often don't realize is how much time, effort and money this space requires - and it's continuing to grow. I spend so many hours keeping up this blog that I had to justify time spent away from my family somehow. I also didn't want my website expenses coming out of my family budget. So it was either put up ads, start charging for my currently free printables or stop posting and take down my website. I thought advertisements to be the best option. I hope you are still able to find my content useful and navigate through the ads. Thank you for reaching out! You are so wonderful! Thank you for this post and all of the useful information linked in it. Thanks to you, I feel like I have a really good head start on next year's music. I am an avid follower of your blog and you have helped me countless times. Thank you for all of your time and effort! It does not go unnoticed! I don't think I can do my calling with out your blog. Thank you for all your time and effort. Thank you for all these wonderful suggestions! The ads don't bother me at all, I'm glad they can offset the cost a bit. Thank you! Camille, my admiration for you just grows and grows! Thank you for the excellent content you always provide! I have loved your ideas (and used them) for many years and am so grateful that you are so inspired and creative! 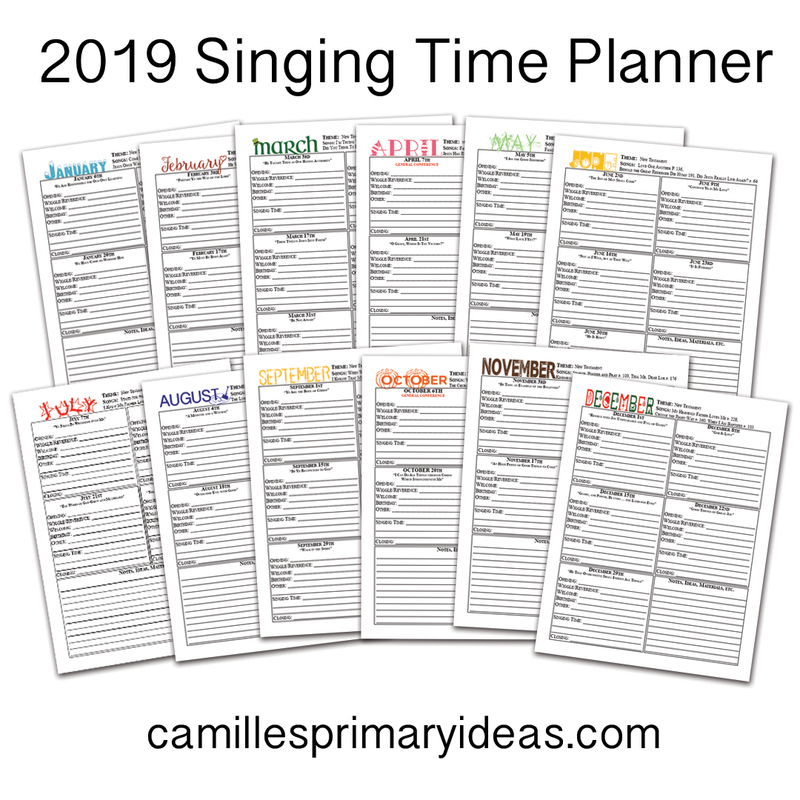 I just wanted to let you know that a sister on the facebook page for ldsprimarymusic leaders has posted a file with even more possible songs for next year. She went through each lesson for next year and noted all songs that were suggested for the lesson. Of course, we don't have to use them all in singing time (just as we can use all or none of the suggested song on lds.org), but it will help us to support teachers if we know what they are teaching that week. Let me know if you can't find the file. It was posted. 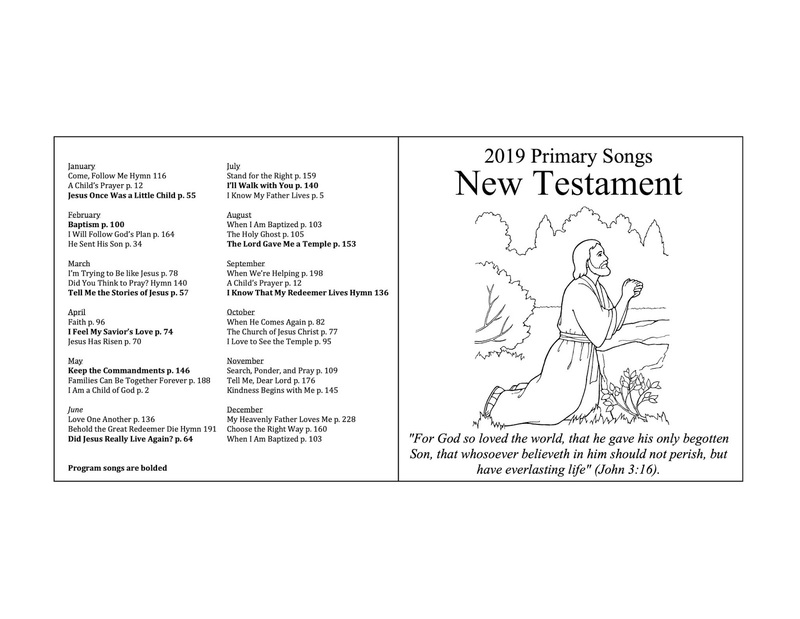 It's by Sister Allison Bitter - titled "Come Follow Me for Primary New Testament 2019 Song List. Thank you for your time, effort and talents. You are a great help and inspiration to so many of us who would be struggling without your input. I am one who appreciates all that you do. This is so helpful! Thank you for sharing all of this with us!